It would be hard to miss now! On any given summer or fall weekend, you’ll notice folding chairs and blankets filling the lawn, passersby pausing on the sidewalk, and live music from local, national, and international artists radiating through the entire city. This green space is now the site of Levitt Pavilion Dayton, part of the national Mortimer and Mimi Levitt Foundation. The foundation, which has sponsored 500 free shows in 26 states across the country in 2018, reinvigorates America’s public spaces by allowing greater access to the performing arts. In Dayton, they’ve done exactly that. The foundation raised $5 million from the community for the pavilion’s construction, which was completed this summer. Levitt has since activated a previously underused space in downtown by gathering families, friends, children, (and even their dogs!) every Thursday–Sunday to experience free, high-caliber concerts and celebrate a shared sense of community. The pavilion will host 50 free shows per year, with this year’s lineup including everything from country artists like Ashley Martin to jazz artists like Dave Greer’s Classic Jazz Stompers. The pavilion will also be available for other events outside of the concert schedule. As soon as the LMG team heard of this exciting community initiative, we jumped on board. 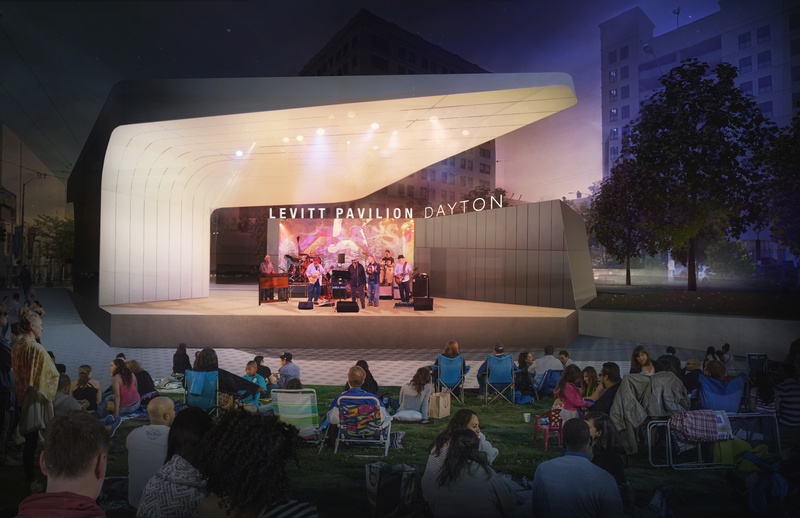 Through strategic and creative collaboration, we put our dedication to downtown and the arts to work alongside the Levitt team and launch the pavilion’s website. Take a tour of the website right here! The first step was to discover and understand their goals for the site. With those in mind, we then conducted a competitive analysis to understand the strengths and challenges of other Levitt venues, as well as other music venues. After evaluating each of these components, we created and shared with the Levitt team options for the site organization and design—including desktop and mobile—that showcased the fun, energy, and community that each Levitt venue exudes. And finally, with Levitt Dayton’s blessing, we designed, developed, and launched the site you see today. 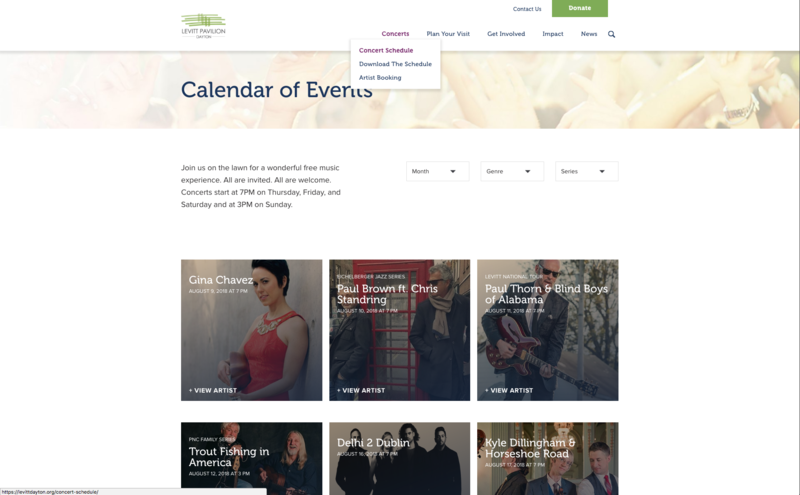 On the site, you’ll find a full concert schedule, volunteer opportunities, the Levitt Foundation history, and more. This is the kind of project that energizes and inspires our team. By working with great clients and partners, we were able to contribute to a true city revitalization and foster a greater sense of pride and love for our community. For more information on Levitt Pavilion Dayton or to see upcoming events, visit levittdayton.org. A creative communicator and dedicated wordsmith, Erin has a passion for personal interaction and meaningful messaging. Her background in journalism and graphic design allows her to see the big picture and zero in on key details, both in content and design. 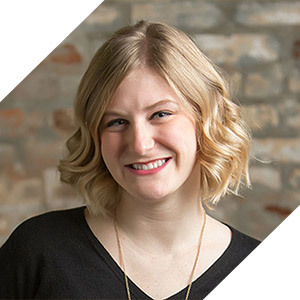 As Copywriter, Erin practices diligence in all aspects of content development—researching, writing, organizing, editing, and proofreading—to communicate clients’ messages in the most effective way to engage target audiences and inspire the desired outcomes.